What if “the holidays” weren’t a specific time of year, but an everyday occasion? What if we scaled back the full-blown pageantry of expectation brought on this time of year, and instead focused on the small milestones of daily life — special occasions created by our own families and occurring throughout the year? 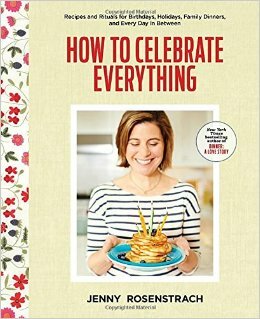 Such is the idea behind Jenny Rosenstrach’s new cookbook and memoir, How to Celebrate Everything: Recipes and Rituals for Birthdays, Holidays, Family Dinners and Every Day In Between. Through lively family anecdotes, beautiful photographs and mouthwatering recipes, the married mother of two girls makes a compelling case for savoring the moment. ParentMap chatted with Rosenstrach on the phone to learn more about her new book and her suggestions for bringing ritual to the everyday. How is this book different from your two earlier cookbooks? The first book, Dinner: A Love Story, was a memoir told through the lens of the family dinner table. It was all about how the family dinner is like the magnetic north — all good things trickle down from sitting around the dinner table together. The next book, Dinner: The Playbook, was a practical guide for getting dinner on the table, a roll-up-your-sleeves for busy families. This third book is not logistics-driven. It’s more of a how-to to make the most of this time. This new book is written for people for way to infuse meaning into their lives, things like rituals and other easy, organic ways to impart meaning into everyday moments. I’m not in the business of guilting anyone. Dinner is hard to pull off. But I want to inspire people to try, and this book is more all inclusive, as a way to help families find rituals that mean something to them. What can your book offer to an American public who is more diverse, more mobile, more scattered and not always close to family? This is a guide, at its heart, to living with more intention. My kids are getting older, ages 14 and 12, and this is it. How am I going to make the most of this time with them? How am I going to make it special for them and all of us appreciating the time of living in the moment? It’s what we all should be doing all the time, children or no children. It doesn’t have to be a Hallmark card or a 7-course meal to make it feel meaningful. Everyone has rituals. Rituals are everywhere. You’re just not looking! If you’re straight from work to a baseball game and your kid’s team wins, you then go to pizza afterwards — that’s a ritual! You don’t have to do a lot; your kid will remember the simple things. She might say, 'I liked it when you sat down at the table and made me cupcakes.' It doesn’t have to be a Hallmark card or a 7-course meal to make it feel meaningful. What problem of family meal making does your book solve? How is that different from other family meal cookbooks? There are so many books about how to celebrate holidays, and that is what this book is about. I come from a household of mixed religion, so I celebrate everything. But at its heart the book is focused on the daily, the weekly, the small days and the big days, the unique family rituals, what no other family does, but yours. The recipes can inspire someone even if they are my foods and my family’s history. The recipes are delicious! Anyone can have this on their own table and personalize it. What I want to share is what happens around the food is as important as the food. My father-in-law writes these poems for special occasions, and while you don’t have to do that, you can still take the idea of making a moment by saying something. Not just what champagne to drink, but what to say when the glass is raised. What’s one thing you recommend to families to start creating rituals right now? A good place to start would be Sunday dinner. Families have more time to shop, to enjoy the process of cooking and then sitting down to eat. It’s a day when people can recalibrate before everyone goes in a million directions at the beginning of the week. It doesn’t have to be elaborate; it’s the idea of everyone sitting together, with kids, maybe light a candle. You don’t need to do much more than that.